Okay, okay, I give in. Here is the wee little guy causing all the excitement around here. Yes, he is even cuter in person. No, he is not staying. Though it is kind of funny that the Kitty Meister has his own little mini-me. I assume he will be with us until he is old enough and big enough to be adopted out to a lucky family. I use the word lucky with only slight sarcasm as like all the other animals around here, he is a little nutty. At only for weeks of age, he seems to have a pretty good idea of how to torment dogs. He must learn a new skill every day. I’ve never lived with a kitten before so keeping him from death-defying leaps has been an interesting experience. I may get my first grey hair by the time he goes home. I guess he’s worth it. That’s what the salon is for. ← Life List Item #98: Perfect My Dog’s Recall – Check?? What a total cutie pants!! My next cat (eventually.. no time soon) will be a little kitten. I think they are HILARIOUS and haven’t had one since I was a little kid. they are just so much fun (though tons of work and a few skipped heartbeats watching them be fearless!). He is definitely entertaining. If I didn’t have other pets to worry about, I could probably sit in the kitten room for hours just watching him run around and attack everything. It’s amazing how something so little can have so much personality. I am determined to turn him into a lap cat but I don’t know if that’s going to happen. He is SO stinking cute! Videos! We demand videos! Oh my goodness! He’s adorable! 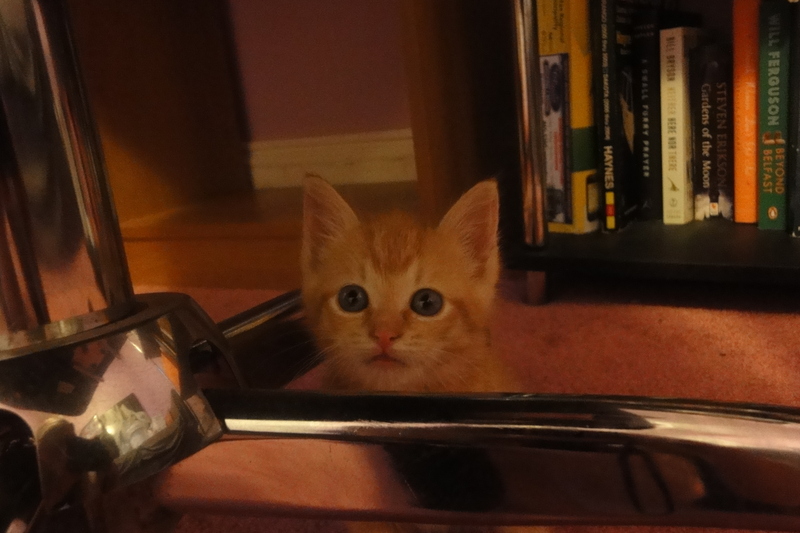 Look at you – fostering! Very nice! He’s pretty cute and I think he knows it. He’s a good “starter” kitten I am told because he is so healthy. We shall see how it goes and if I am brave enough to do it again. BABY CATS! Omg i’m dying from the cuteness in your house. It’s pretty ridiculous, I can’t lie. 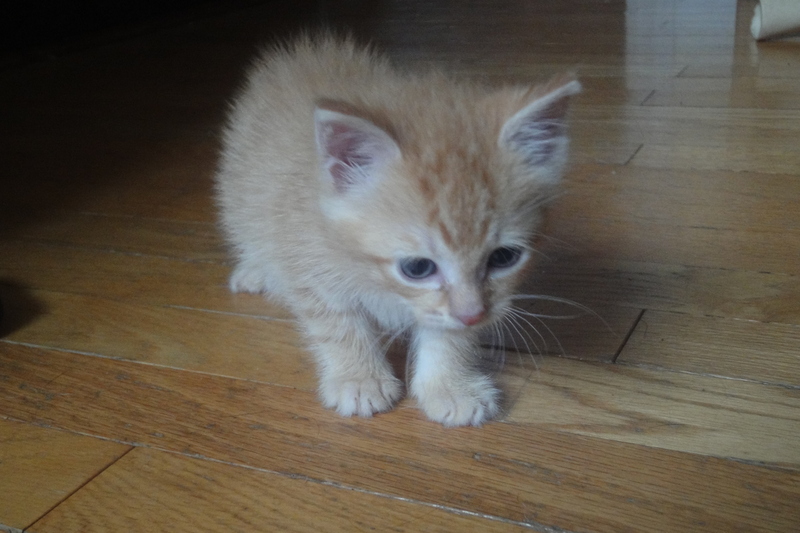 Everyone should foster kittens just for the sheer cute factor. There is no better greeting on returning home. That’s hilarious! Did your dogs get along with her okay? We’ve been introducing them slowly as Shiva is just so much bigger. I am not worried she would hurt him on purpose but I don’t want to give her a chance to chase him where she might hurt him accidentally. Do you have any suggestions for integrating dogs and kittens? I’d love to hear what you did! My only concern was that they could roll over on her and smother her, but it never happened:) When Kaya was a pup, I got foster cats right away to teach her to be respectful to kitties, so by the time the kitten arrived it was no big thing. With the first foster kitty, I did spend a few days with her on leash to teach her to be gentle. I’d have her lie and give them both treats. Then when the cat was running around I’d say “leave it” and use the leash if she wasn’t listening, then give her a really good treat whenever she’d pay attention to me and not the cat. You could also try putting Shiva on a tie down with a good bone or chew, while the kitten runs and plays, she can learn it’s a good time to be calm and she’ll get more immune to the chaos. Good luck! Aww, cutie!! I can only imagine trying to keep him from jumping off high things! 🙂 Good luck not going completely gray before he gets adopted out…! Oh My Dog…He is one cute kitty! I am glad I can’t afford to keep him as it’d be hard to give him up otherwise! Oh no, I am so sorry Stormy’s first home didn’t work out. Hopefully this family will be the perfect fit for him. I think it was incredibly kind of you to share your home and humans with him in his time of need. You are a generous dog, Toby. Adorable! My memories of having kittens is that they are all a little psycho. I used to call my last ones “kitty monsters”. That is great you are fostering, enjoy! I hope to be able to try that one day. Good to know his behaviour is normal… 😉 “Monster” definitely suits him! 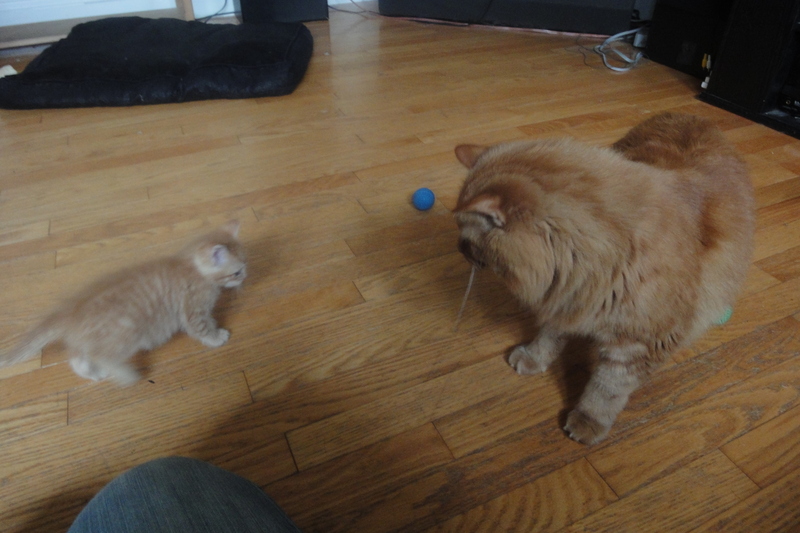 Oh good lord, look how tiny he is next to resident kitty! 🙂 So amazing of you to foster, I wish I could do it too! I don’t know if it’s that good of me. Just figured it was time I finally bowed to the pressure. So far, so good! And I was whining about how hard puppies are? I have a feeling you are going to shame me big time. Hahaha! You definitely should! 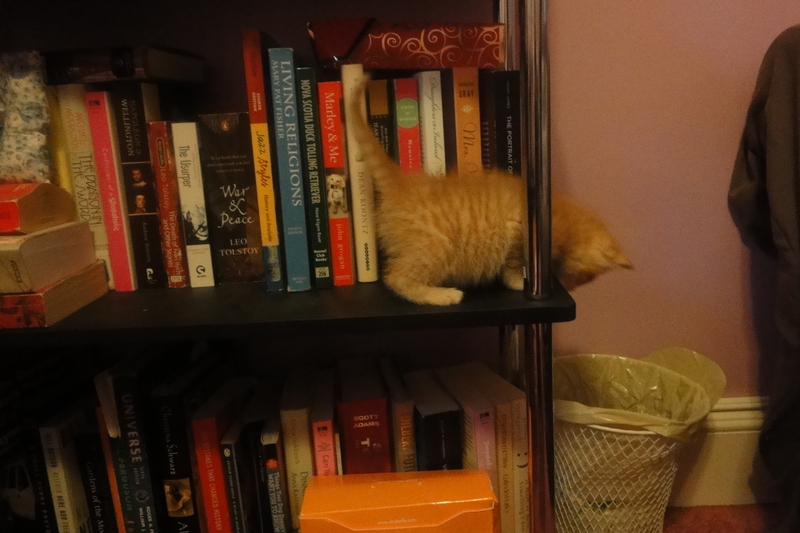 Everyone needs a kitten for the entertainment factor alone. Okay . . multiply that by 5!!! I have 5 crazy little monsters in my guest room (with ringworm!!) They are so adorable – hope you are having fun!! Ringworm, too! Yikes. I am so glad our little guy is so healthy. I don’t think I’m ready for anything too complicated or worrisome. You are an inspiration! I hope your guys get better and are all able to find new homes soon! Though I am sure you are having fun in the meantime. O he is so so lovely, where did he come from?? So sad, but at least he now has you guys!! I think you are so brave taking him on until he finds his forever home, typist is rubbish and would want to keep him forever – in fact she already does! Good job there is a large distance between us! YOU’RE NOT KEEPING HIM?!? He’s the cutest little thing EVER!!! SQUEEEEEEEEEEEE!!!!!!! OMD, he is SOOOOO cute! And fluffy! And organgey! And Most Adorable! Mom says that there’s nothing that will make you laugh harder than a baby kitteh and that you should most definitely enjoy your time with the little fluffy critter. Oh what a cutie! He looks like our Gerrard who we found when he was a few days old, his eyes weren’t even open yet. Are you sure he’s not staying?! How many times have you lost him? Gerrard used to slide under the kitchen stove when being “chased”. It is amazing the places those little things can get into. He’s so cute, looking forward to more pictures! He’s even cuter than he appeared on my cell phone. Definitely a mini-me. Amazing how close they look in appearance. A kitty? You may indeed go gray. They are so much braver than I would have been if I were a kitten. How do they do it? Those death-defying leaps? Egads!